It's been a long time coming, but thanks to various trades, eBay purchases and the kindness of forum friends, I've managed to assemble Waves 1 and 2 of Mattel's Target Exclusive Public Enemies Series, mostly to put together the Brimstone Collect and Connect figure. I'll get to the Brimmy shortly, but let's look at the regular figures first. I'm less hostile towards these DVD tie-in figures than I was when they were first shown, because if nothing else they are very faithful to the representations of the characters in the Superman / Batman: Public Enemies animated film. Still, the decision, if it was a conscious one, to make these figures in a slightly larger scale to the DC Universe Classics line is really perplexing, and makes most of them pretty useless in terms of cross-display with the DCUC figures. Silver Banshee and Major Force are the only two figures that have much of a chance of making it into my display, but each has some detracting issues. Banshee may be a tad taller than her DCUC counterparts, but she's still got those horribly skinny upper arms, and also has loose ankles so she tends to fall over on her face alot. 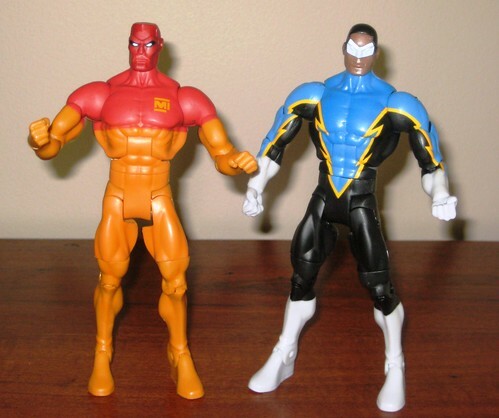 Major Force's main issues are colour scheme (accurate to the DVD but not his most common appearance in the comics), a very exaggerated animated face and being a tad tall to pair with archenemy Captain Atom. I'll deal with this last one with flight stands and keep my hopes up for proper DCUC versions of both of these worthy characters. Black Lightning is pretty pointless as he's been done better and more comic accurate, and Icicle... well, my dog needs a new toy. He might be a dead ringer for the animated version, but the animated version's crap. Mega lost opportunity to do something better with this one. As for Brimstone? He's certainly not going to the top of the list of my favourite Collect & Connect figures anytime soon, but he's adequate. Unlike most of the DCUC C&Cs, his head is not a separate piece, but joined with the torso, and the figure suffers from the lack of detail in the headsculpt. The slightly translucent material in his limbs is a fun addition. Overall - happy to have him in the back of the collection, but he could have been done better. So that's the rundown on what I hope is a one-off experiment from Mattel, unless they can find a way to produce figures that make collectors happy, or at least don't tease us with unwanted versions of characters that have yet to be made in the DCUC line. You can see more pics at Facebook, discuss this at the AFB Forum, and comment on this post to enter the March AFB Comment of the Month Contest. ** This month only, an AFB Facebook Fan will be randomly selected to receive a second prize, so be sure to become one of our Facebook Fans! Well done on getting them all! Your review means I probably won't bother now. Congrats for picking them all up Scott, but gee I dunno. Those paint apps look like 1991's way of waving at us and saying "hello". 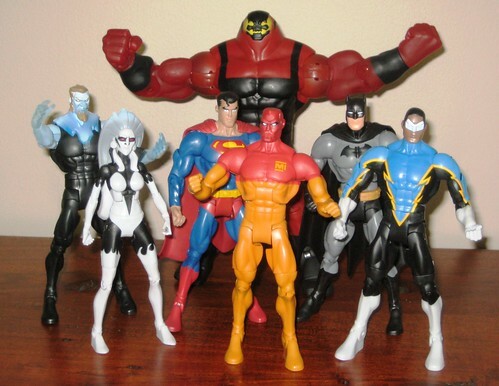 I think Major Force is supposed to be a bit taller and bulkier than Captain Atom, so that would be OK I guess. he's the only figure I want, the others, you said it... Dog food. glad you were able to get them though the paint job makes them look like they were left over from total justice. and icecicle looks like he fell over into some blue paint. silver banshee looks like a rejected prototype for a were wolf figure. Yeah, I have no interest in most of these guys either. Brimstone is cool for what he is, a big hulking bad guy but you have to buy the rest of these guys to get him. Major Force would be ok even with being a tad on the tall side as again big imposing bad guys seem more dangerous. I actually like how they all look like their animated counterparts. But there is the problem of them being so different from the rest of the DCUC, if Mattel made more in this style they would be better IMHO. Also one can only assume they won't make another major force/silver banshee/icicle for awhile now. Unfortunately, these aren't as good as they could have been, but I'm happy enough with Brimstone to get over most of the shortcomings of the others.